Playing the role of Tina Denmark in Ruthless! The Musical ain’t no child’s play. But today, the young actresses who will take on the ambitious central character have been announced. Fifi Bloomsbury Khier, Charlotte Breen, Anya Evans and Lucy Simmonds will take turns playing Tina in the killer cult classic during its strictly limited run at the Arts Theatre. The four performers join Jason Gardiner, Lara Denning, Kim Maresca, Harriet Thorpe and Tracie Bennett during its run from 16 March – 23 June, with press night on 27 March. Joel Paley and Marvin Laird’s award-winning show is making its UK premiere following 25 years of critically-acclaimed performances Off Broadway. Ruthless! The Musical follows Tina Denmark – a beautiful and talented 8-year-old who will do absolutely anything to land the lead role in her school play. The star-in-the-making has a thirst for the spotlight, but how far will she go for top billing? The raucous musical spoofs everything from Gypsy to Mame, as well as iconic films including The Bad Seed and All About Eve. Book your Ruthless! The Musical tickets today. 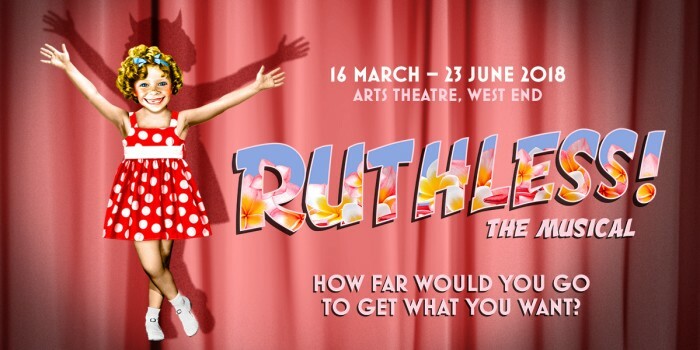 Tracie Bennett and Jason Gardiner star in Ruthless!